Technology Blog : DECIDE WHAT TYPE OF CONTENT PAGES TO USE WHILE MAKING YOUR INTRANET? DECIDE WHAT TYPE OF CONTENT PAGES TO USE WHILE MAKING YOUR INTRANET? SharePoint Foundation: SharePoint Foundation is a foundational program that enables communication, collaboration, and content management; it comes free with the Windows Server operating system. SharePoint Server: SharePoint Server is a full-featured software product that provides industrial-grade communication, collaboration, and content management. It’s like SharePoint Foundation on steroids. SharePoint Server comes in an Enterprise and Standard edition for both Internet sites and Intranet sites. InfoPath Form Services: This feature of SharePoint Server allows InfoPath forms to be embedded in SharePoint Web sites. Excel Services: This feature of SharePoint Server embeds Excel documents in a SharePoint Web site where they can be viewed (which helps with version control). SQL Server Reporting Services (SSRS) Integration: This feature installs an SSRS server in such a way that it works closely with the SharePoint environment. In an integrated installation, SSRS reports are contained and managed in SharePoint instead of in a standalone program (Report Manager). Key Performance Indicator (KPI): A feature of SharePoint (and of SSAS) that provides a quick visualization of business information that the organization considers indicative of how well it’s doing. KPI data is contained in a KPI list that can be embedded in SharePoint Web sites. Business Connectivity Services (BCS): BCS is a feature of SharePoint that connects to Line of Business (LOB) systems and displays the data that they contain in the SharePoint environment. The data can then be manipulated (read and write) directly from SharePoint with users having to know, or care, where the data lives behind the scenes. Sites: A SharePoint site is a Web site that SharePoint manages in ways that are compatible with its content-management features. SharePoint sites can contain many user facing SharePoint features such as Document Libraries, Lists, Wikis, Blogs, and Discussion Boards. Document Libraries: A mechanism for storing content within SharePoint. A Document Library provides content management (which includes document check-in and check-out, versioning, security, and workflow). Lists: Lists of data, made available on a SharePoint site, that store data in columns and rows. Almost all of the user facing SharePoint features stem from Lists. For example, a Calendar is actually a specialized List under the covers. Wikis: Specialized Web sites that allow community members to update content on the fly. SharePoint provides wiki functionality as a feature. Blogs: A Web log or online journal. A blog provides a forum for people to write communications that can be viewed across the entire organization. Once a blog entry is posted, the content can attract comments and discussions on the entry page. Blogs came to prominence as personal online journals; SharePoint provides tools for getting business blogs up and running in a manner of minutes. Discussion Boards: A designated intranet location for online discussion, accessible throughout the organization. A discussion board provides a forum for people to post questions and replies that can be viewed throughout the organization. Performance Point: A feature of SharePoint that is designed to build advanced scorecards, dashboards, and reports. Dashboard Designer: An end user tool that can be launched from SharePoint and is designed to build Performance Point content. Report Builder: An end user tool that can be launched from SharePoint and is designed to build SQL Server Reporting Services (SSRS) reports. Scorecard: A collection of data that includes graphs, charts, numbers, and other visualizations of information that is designed to show progress towards a stated goal. For example, you might have a Scorecard that shows sales per quarter per sales person and how well that sales person is performing against a target goal. Dashboard: A Dashboard is much like a Scorecard with the difference being that a Dashboard shows the status of key information but is not necessarily in relation to an overall goal. For example, you might have a dashboard showing current production on a day, week, month, and year to date scale without having a specific target production output you are trying to reach. I am sure that all types are required and while designing corporate intranet we will end up with using all the three.I still feel like there are differences which are worth discussing because while implementation we should use these pages very cautiously and on right place. Typical Usage Scenario: Complete control over look and feel; more granular content management. Typical Usage Scenario: To display Web Parts; no content management requirement. Typical Usage Scenario: Pages that look and function like the home page. Let me explore bit and show you which page to use where? 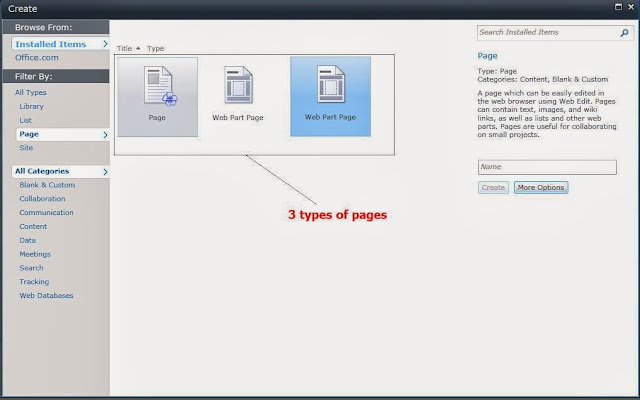 Here you see option in SharePoint where we create pages for our SharePoint portal.. If you want to standardize the look & feel and layout of home pages across intranet for multiple departments. Web part pages is good choice for us to allow department content owners to add content in more controlled manner.Finally if you don't bother about content presentation and standardization of layouts just choose Wiki because of it’s WYSIWYG in-page editing capabilities.